The 2004 Indian Ocean earthquake and tsunami, also called the Sumatra-Andaman earthquake (known by the scientific community), was a great underwater earthquake. It happened at 00:58:53 UTC (07:58:53 local time) December 26, 2004. The epicenter of the earthquake was off the west coast of Sumatra, Indonesia. At first, the earthquake was measured as a 9.0 on the Richter scale. It was the longest ever recorded ocean earthquake. It lasted between 500 (8.3 minutes) and 600 (10 minutes) seconds. It was so powerful that it caused the entire Earth to vibrate. It started other earthquakes as far away as Alaska. The large movement of earth under the water caused a very large and powerful tsunami. 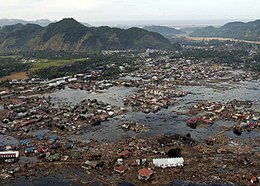 The tsunami was called the Asian tsunami, or the Boxing Day tsunami in Australia, Canada, England, and South Africa because it happened on the 26th of December 2004 (Boxing Day). It spread all over the Indian Ocean. The tsunami caused heavy damage to countries such as Malaysia, Thailand, Indonesia and Sri Lanka. It also devastated the eastern coast of India, such as the states of Tamil Nadu, Orissa and Andhra Pradesh. Waves as high as 30m (100ft) killed many people and damaged or destroyed a lot of buildings and other property. Over 225,000 people died or were not found after the tsunami. The wave did damage in East Africa as far away as South Africa (8000km/ 5000mi) where as many as 8 people died because of high water caused by the wave. Because of how much damage was caused and the number of people the earthquake affected, over $7 billion (USD) was donated to help rebuild the areas damaged. Wikimedia Commons has media related to 2004 Indian Ocean Earthquake. After the Tsunami Danish writer and photographer Thorsten Overgaard's documentary on the relief work after the December 26, 2004 tsunami. ↑ "Indian Ocean Tsunami – Economic Aspects". indianoceantsunami.web.unc.edu. ↑ "Astonishing Wave Heights Among the Findings of an International Tsunami Survey Team on Sumatra". U.S. Geological Survey. Retrieved 16 June 2016. ↑ Paris, Raphaël; Cachão, Mário; Fournier, Jérôme; Voldoire, Olivier (1 April 2010). "Nannoliths abundance and distribution in tsunami deposits: example from the December 26, 2004 tsunami in Lhok Nga (northwest Sumatra, Indonesia)". Géomorphologie : Relief, Processus, Environnement 16 (1): 109–118. doi:10.4000/geomorphologie.7865. http://geomorphologie.revues.org/7865. ↑ "Joint evaluation of the international response to the Indian Ocean tsunami: Synthesis Report" (PDF). TEC. July 2006. Archived from the original (PDF) on 2006-08-25. Retrieved 9 July 2018. ↑ "Earthquakes with 50,000 or More Deaths". U.S. Geological Survey. Archived from the original on 5 June 2013. ↑ "Indian Ocean tsunami anniversary: Memorial events held". BBC News. 26 December 2014. Retrieved 15 December 2016. This page was last changed on 18 April 2019, at 13:30.